Shifting Gears: fishermen, scientists, conservationists agree that some widely-used fishing gears cause severe harm to marine environment in U.S.
WASHINGTON-There may be more than one way to catch a fish, but not all are environmentally friendly. Some fishing gears widely used in U.S. ocean waters severely damage seafloor habitats and kill far more than the species they target, according to a first-of-its-kind report released today by Marine Conservation Biology Institute (MCBI). The report's findings are based on a survey of fishermen, regulators, scientists and conservationists, who compared and ranked the level of damage 10 major commercial fishing gears cause to the marine environment. Bottom trawls - large, heavy nets that are dragged across the seafloor to catch cod, flounder, rockfish, shrimp and other popular ocean delicacies - topped the list of the most harmful fishing gears. share the same point of view on fishing matters. the sea," said MCBI President Dr. Elliott A. Norse. Of primary concern to the survey's respondents was the impact of fishing gears on ocean habitat. 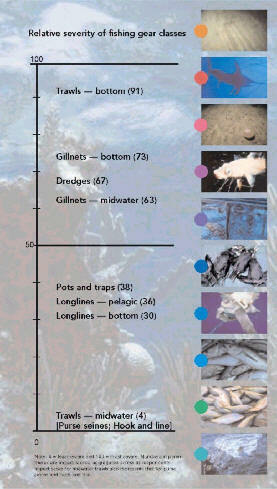 The marine professionals polled consistently assigned greater ecological value to seafloor organisms and structures - which serve as nursery areas, refuges and homes for fishes - than other marine ecosystem components. Ninety-eight percent of marine species live in, on or immediately above, the seafloor. Though second to habitat, bycatch - the unintentional capture and discard of non-target marine life, including shellfish and crabs, marine mammals, sea birds, sea turtles, sharks and other fishes - was also a concern. Currently, almost one-quarter of global fisheries catches are discarded at sea, dead or dying. Scientists estimate that 2.3 billion pounds of marine life were discarded in 2000 in the United States alone. In addition, many uncommon, threatened or endangered ocean species, such as sharks, sea turtles, sea birds and marine mammals are killed in fishing operations. Scientific evidence indicates that fishing gears that contact the seafloor, including bottom trawls and dredges, damage the very habitats that marine life depend on for their survival. These collateral impacts of fishing gears - both bycatch and damage to seafloor habitats - alter marine food webs and destroy fishes' crucial shelters and feeding sites, thereby reducing the ability of marine ecosystems to sustain fisheries. While there has been clear documentation of the environmental impacts caused by some fishing gears, until now no scientific method has addressed which gears are the most harmful. Shifting Gears is the first to synthesize information about the collateral impacts of various fishing gears, gauge the severity of these impacts and, with input from fishermen, regulators, scientists and environmentalists, compare and rank the overall ecological damage these gears cause. "This report is a ray of hope for the health and well-being of our oceans," said MCBI Chief Scientist Dr. Lance E. Morgan, who co-authored the report with Virginia Institute of Marine Science Assistant Professor Dr. Ratana Chuenpagdee. "It demonstrates that common ground exists for improving the way we catch fish in America." "Our research indicates that shifting to more selective, environmentally-friendly gears could mean the difference between having plenty of fish to go around and ecological and economic disaster," said Chuenpagdee. "If we want to have fish on our tables and jobs for those who catch them for us, we need to use ecologically sustainable fishing technologies." Shifting Gears was prepared by MCBI, and initiated and supported by The Pew Charitable Trusts. The report was published by Island Press Publication Services. MCBI was founded in 1996 to advance the new science of marine conservation biology and to promote cooperation essential to protecting and restoring the Earth's biological integrity. It does this by encouraging research and training in marine conservation biology; bringing scientists together to examine crucial marine conservation issues; doing policy research to frame the marine conservation agenda; lecturing, producing books and other publications to educate scientists, the public and decision makers on key issues; and building partnerships to solve problems affecting marine life and people.